Nepenthes rafflesiana is a heavy-hitting lowland species with broad variability and even broader size. Leaves reach one to two feet (0.3-0.6 m) in length, and thrive in humid greenhouses with hot days and warm nights. Hailing from Malaysia, Sumatra, Singapore, and Borneo (Brunei, Sabah, and Sarawak) at an elevation of 3,900 feet (1,200 m) and below, N. rafflesiana has several named forms that may vary in size and color, but are all united by their beauty. 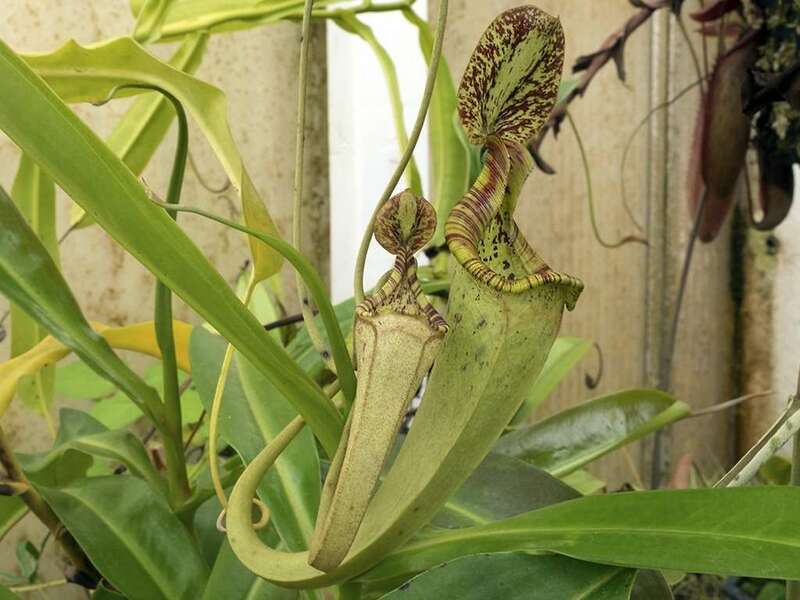 It is neighbors (and hybridizes) with other lowland Nepenthes like N. ablomarginata, N. ampullaria, N. bicalcarata, N. gracilis, and N. mirabilis. Nepenthes rafflesiana was named in honor of Sir Thomas Stamford Raffles, a British explorer, colonial leader, and founder of Singapore. The plant has gone by many other names in the past, like N. sanderiana, N. sanderi, N. raflesea, N. nigro-purpurea, or N. hemsleyana. It is impossible to conceive anything more beautiful than the approach to Singapore, through the Archipelago of islands that lie at the extremity of the Straits of Malacca. Seas of glass wind among innumerable islets, clothed in all the luxuriance of tropical vegetation and basking in the full brilliance of a tropical sky… I have just arrived in time to explore the woods before they yield to the axe, and have made many interesting discoveries, particularly of two new and splendid species of pitcher-plant [Nepenthes rafflesiana and Nepenthes ampullaria], far surpassing any yet known in Europe. I have completed two perfect drawings of them with ample descriptions. Sir S. Raffles is anxious that we should give publicity to our researches in one way or other and has planned bringing out something at Bencoolen. 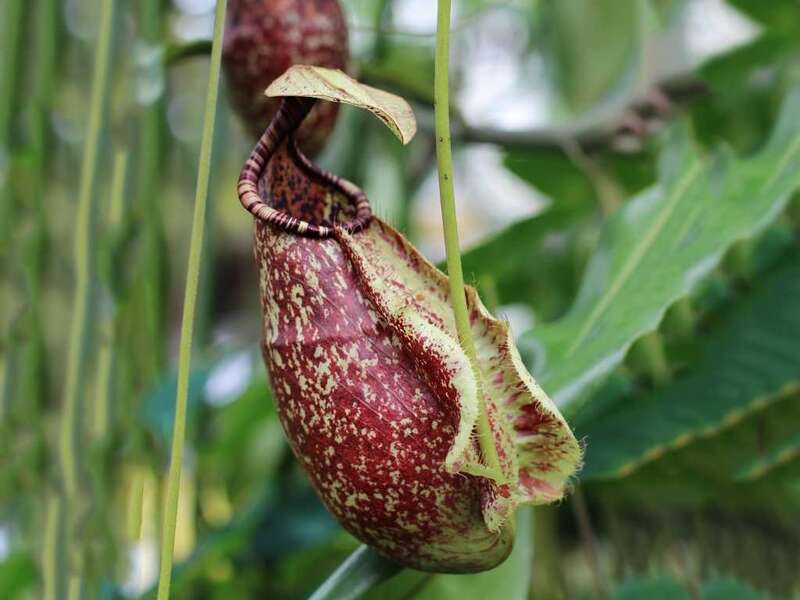 He proposes sending home these pitcher-plants that such splendid things may appear under all the advantages of elegant execution, by way of attracting attention to the subject of Sumatran botany. Most forms have chunky lower pitchers with robust wings, a tall neck formed by a beautifully striped peristome itself comprised of fine spine-like teeth. Atop the neck is a large lid that could be used as an umbrella for mice…. Or big ol’ pitchers. Smaller varieties have lower pitchers around 5 inches (12.5 cm) in size that act a canvas for beautiful red and purple splotching. Remember, Nepenthes rafflesiana is a variable species, and pitchers vary in color and size, with some over 1 foot (0.3 m) in length. The showiest forms will drop these massive pitchers down on 5 foot (1.7 m) tendrils and beg you to drop last night’s leftovers in them. Nepenthes rafflesiana peristomes are also variable, but generally share a characteristic shape with a long neck, ovalish mouth and, what I can only describe as, a strong “chin” at the bottom. This is especially pronounced in upper pitchers which tend to lose some darker coloration in lieu of a greenish-yellow hue. South America may boast of its gigantic water lily, Sumatra of its stupendous Rafflesia arnoldii, or Trinidad of its curious vegetable butterfly, all of which are alike vegetable wonders; but not less amazing than any of these in the estimation of horticulturists, is this singular and most superb species of Nepenthes. Whoever has seen this plant in a living stat must undoubtedly be constrained to consider it as one of the most astonishing productions of the whole vegetable kingdom. The resemblance which a portion of it bear to our more familiar domestic utensils leaves a lasting impression on the minds of spectators that is not easily eradicated. Nepenthes rafflesiana is a terrestrial Nepenthes – no tree-climbing for this pitcher plant. It does produce long, branched stems up to about 50 feet (15 m) that scramble across low-lying vegetation on forest floors. The plant is hearty, and adapted to thrive in generally lower light conditions and numerous soil types. You’ll want to grow it in conditions brighter than 50% shade in cultivation to avoid spindly leaves and floppy pitchers. You’ll find it naturally growing in humus, peat, clay, sand, and laterite. This makes it a great candidate to experiment with, but you can keep it simple and stick to the long-fibered sphagnum moss. • The form Nepenthes rafflesiana var. nigropurpurea, as described by Maxwell Masters in 1882, has pitchers that are deep red with lime green speckling and green wings. • N. rafflesiana var. nivea, collected by Frederick Burbidge, has pitchers that are creamy with red speckling and white stem hairs. • N. rafflesiana var. nivea elongata is similar to the above, but with narrower, taller pitchers. • N. rafflesiana var. alata has fun wings that run all the way down the pitcher and continue into the upper portion of the tendril. This variety contains variations with pitcher color ranging from green, touched with purple peristome and wing highlights, to red-blotched. 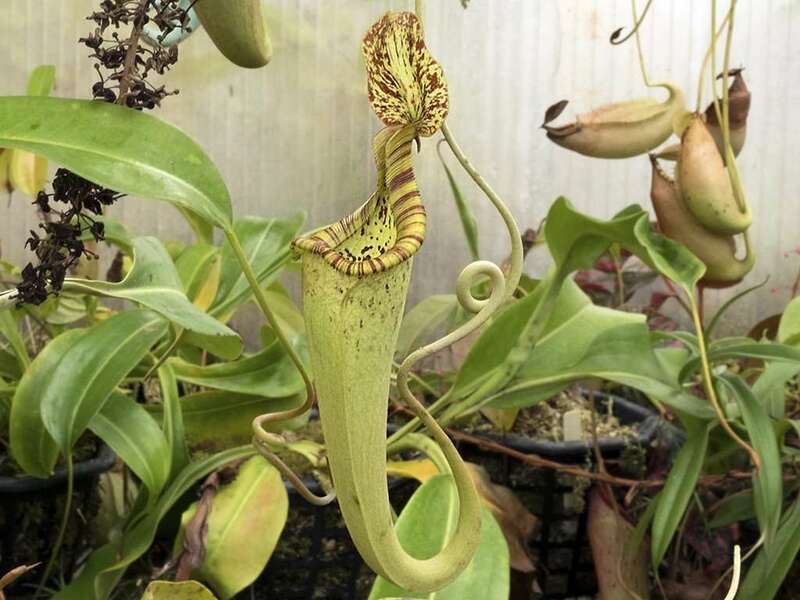 This list likely to grow due to the variability of Nepenthes rafflesiana. I will add more varieties in the future.